Seeking Electrical Engineering sophomores, juniors, and seniors for fulltime and summer internship positions related to microwave/ RF. 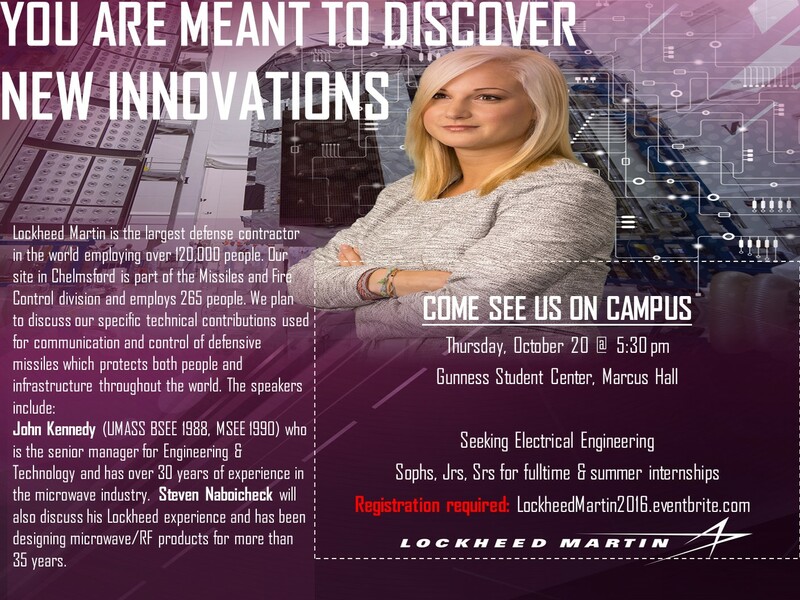 Lockheed Martin is the largest defense contractor in the world employing over 120,000 people. Our site in Chelmsford is part of the Missiles and Fire Control division and employs 265 people. We plan to discuss our specific technical contributions used for communication and control of defensive missiles which protects both people and infrastructure throughout the world. John Kennedy (UMASS BSEE 1988, MSEE 1990) who is the senior manager for Engineering & Technology and has over 30 years of experience in the microwave industry. Steven Naboicheck will also discuss his Lockheed experience and has been designing microwave/RF products for more than 35 years.